Congratulations to our iCoSys colleague Prof. Andreas Fischer! 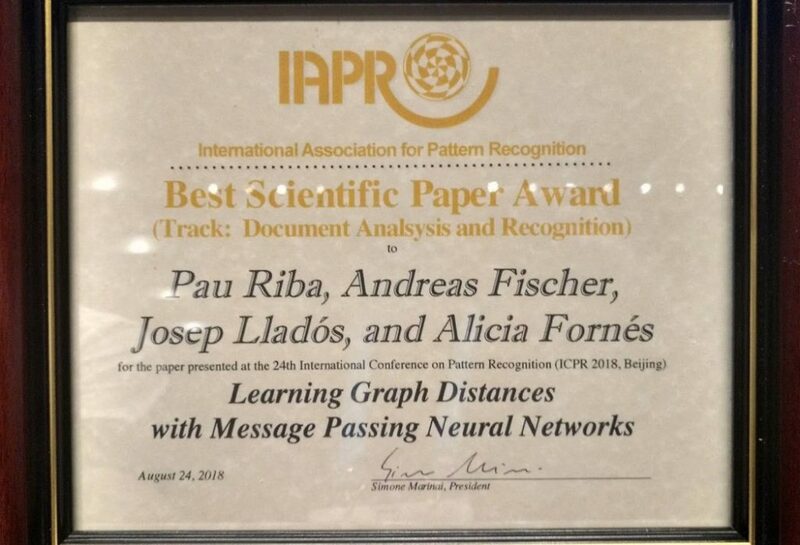 He co-authored with Pau Riba, Josep Llados, and Alicia Fornes a paper that has been acknowledged with a Best Scientific Paper Award at the ICPR 2018 conference in Beijing, the flagship conference for research on Pattern Recognition. The work has been developed during a research visit of Pau Riba from the CVC Barcelona, in collaboration with iCoSys and the University of Fribourg. It investigates the application of methods from the nascent field of geometric deep learning to the problem of graph-based pattern recognition. The aim is to derive a dissimilarity measure between two graphs that is, both, efficient and learned from data. More details on our contribution: A graph is one of the most general data structures in computer science. For example, a graph can model connected atoms in molecules, linked web pages, computer networks, befriended people in social networks, neighboring pixels, and graphical symbols in document images, to name just a few. In graph-based pattern recognition, the availability of efficient methods for graph comparison is crucial. Typical challenges include problems with high computational complexity and the question how to integrate machine learning into the matching process. Our work proposes a way to tackle both challenges at the same time using message passing neural networks and demonstrates a solid performance for difficult classification tasks in the field of document analysis. The proposed method, however, is not specific to document analysis. Indeed, we believe it has a promising potential for a wider range of problem domains that can be addressed by graph-based pattern recognition.